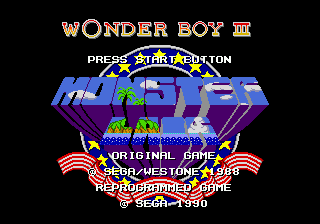 Wonder Boy III - Monster Lair © 1991 Sega Enterprises, Limited. Wonder Boy III - Monster Lair for Mega Drive was released in 1991 (exact date unknown) in Europe. It debuted in North America nearly two decades later on the Nintendo Wii Virtual Console (see Ports below). PC [Steam] [US] (jan.26, 2011) "Wonder Boy III - Monster Lair [Model 71168]" : both stand-alone and as part of "SEGA Genesis Classics Pack 4"
PC [Steam] [EU] (jan.26, 2011) both stand-alone and as part of "SEGA Mega Drive Classics Pack 4"
[EU] PC [MS Windows, CD-ROM] (feb.4, 2011) "Sega Mega Drive Classics Collection Vol. 4"
PC [MS Windows, DVD-ROM] [US] (mar.15, 2011) "Sega Genesis Classic Collection - Gold Edition"
PC [MS Windows, DVD-ROM] [EU] (mar.18, 2011) "Sega Mega Drive Classic Collection - Gold Edition"
PC [Steam] [US] (mar.25, 2011) "SEGA Genesis Classics Collection"
PC [Steam] [EU] (mar.25, 2011) "SEGA Mega Drive Classics Collection"